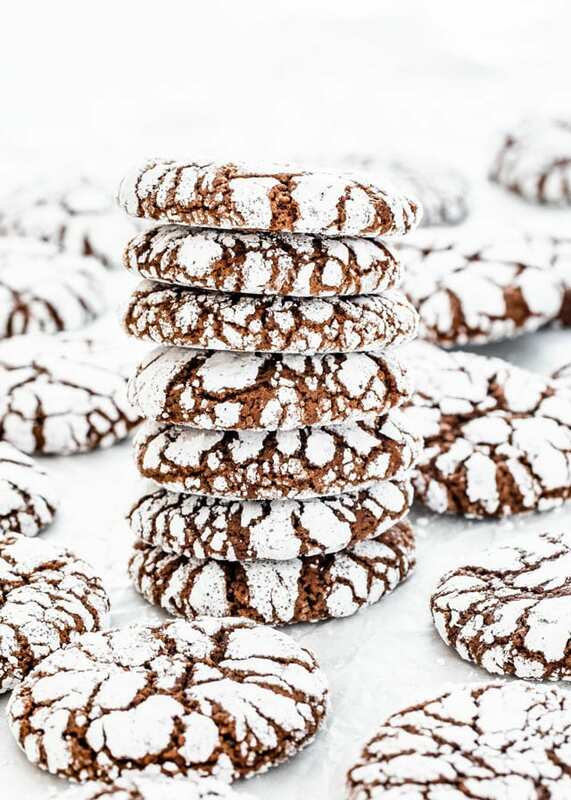 These Chocolate Crinkle Cookies are rich and fudgy, coated in sugar then baked to perfection. Perfect for that chocolate craving and a must for your holiday table! Oh these cookies! 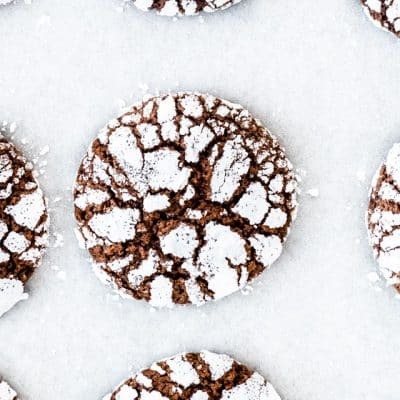 These chocolate crinkle cookies! These cookies look fabulous and are adorable. To me they look like little ornaments. But that’s not it. If you’ve never tried these cookies they are to die for, they’re crunchy on the outside and soft on the inside like a brownie. They are so good. Totally worth all the trouble. 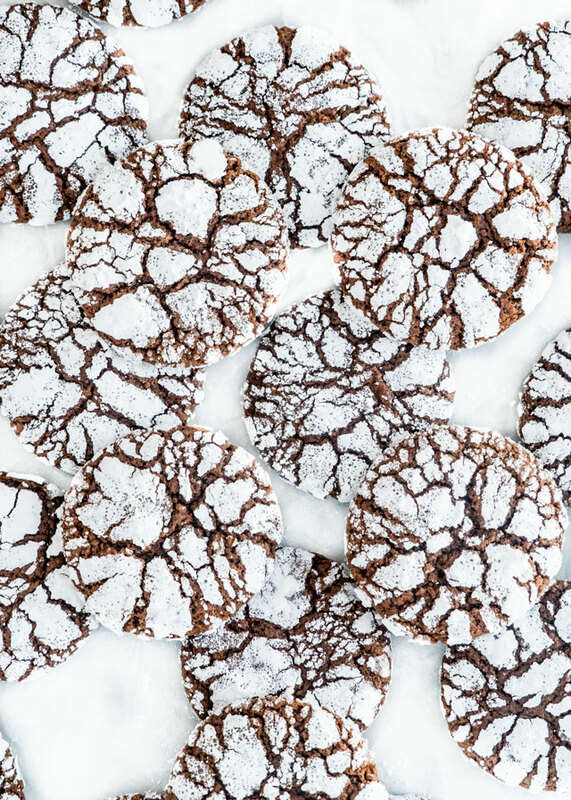 These cookies are a holiday staple. I first started making these about 5 years ago and never looked back since. Now, I make them every year for the holidays. I even double the recipe because they are everyone’s favorite. These cookies get their well deserved name because of the way the cookie splits and cracks along the sugar covered top as it bakes. 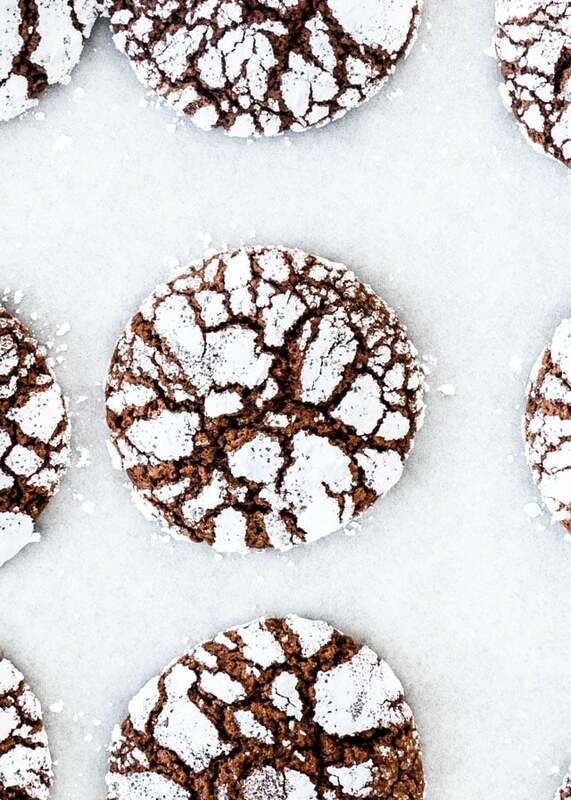 These cookies are perfectly crispy on the outside, yet fudgy on the inside. Most crinkle cookies get only one single coating of sugar, but my recipe goes even further. I rolled mine firs in granulated sugar, then powdered sugar. This adds a little extra crunch to the outside of the cookie. Totally worth it. As with most cookie recipes, always make sure your ingredients are at room temperature. Start by mixing the butter and sugar together. Your butter should be softened but not melted. Mix until well combined. Add in the eggs one at a time and continue mixing until light and fluffy. Stir in the Grand Marnier. The Grand Marnier will give these chocolate a hint of orange flavor. Chocolate and orange are a great combination. However, if you prefer an alcohol free version, use orange extract or vanilla extract. In a separate bowl combine all the dry ingredients. Gradually add the dry ingredients to the mixer and mix until well incorporated. Do not over mix. You have to cover and chill this cookie dough for at least 4 hours and this step cannot be skipped. This cookie dough is quite sticky, so chilling is a must. It ensures thicker cookies and that fudgy texture we love. It also prevents the cookies from spreading out too much. All that’s left is to form into cookie balls, roll through the two sugars and bake. I usually store mine in an airtight container either on the counter or in the fridge. Stored properly like this, they will last 3 to 5 days. That’s assuming nobody eats them all before then. These cookies are great for freezing. I usually double the recipe, leave a dozen out for us to enjoy and freeze the rest. I store them in an airtight container in the freezer and will last up to 3 months. Preheat your oven to 350 F degrees. Line 3 baking sheets with parchment paper. Set aside. In the bowl of your mixer add the softened butter and sugar and mix until well combined. Add the eggs, one at a time and continue mixing until light and fluffy. Stir in the Grant Marnier. In another large bowl combine the flour, cocoa powder, baking powder and salt. Gradually add the flour mixture to the mixer bowl and mix until combined. Do not over mix. 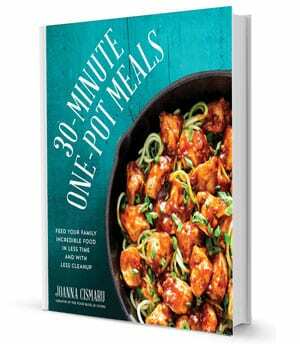 Cover the bowl with plastic wrap and chill for 4 hours to overnight. Place the remaining sugar and powdered sugar in 2 separate shallow plates or bowls. Form the dough into 1-inch balls. Use a cookie scoop for evenly sized cookies. 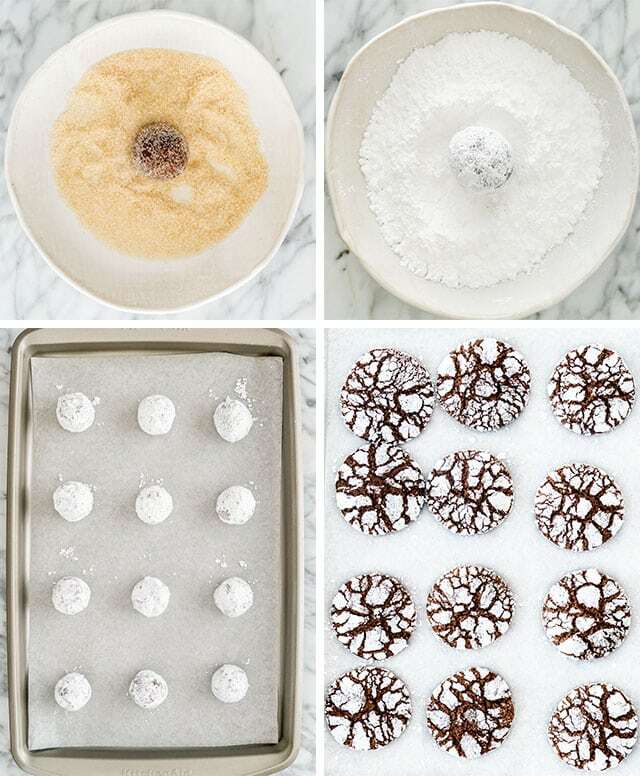 Roll the cookie balls first in the granulated sugar and then in powdered sugar. Make sure they are coated properly. Transfer the cookies balls to the prepared baking sheets and arrange about 1 1/2 inches apart. You should be able to fit about 12 cookies per sheet. Place the baking sheets to the preheat oven and bake for 10 to 12 minutes until the cookies are puffed and cracked. If placing 2 cookie sheets at once, switch them halfway through. Let the cookies cool for 5 minutes on the baking sheets, then transfer them to racks to cool completely. If you don't have 3 baking sheets, you can use the same one, however, let the baking sheet come to room temperature before placing the next batch of cookies on it. What Can I Substitute Grand Marnier with? Use any other orange liquor. For a non alcoholic version use orange extract or vanilla extract. If using extract use only 1 tsp. Stored properly in an airtight container, these cookies will last 3 to 5 days. These cookies freeze well. Place them in an airtight container, and freeze them for up to 3 months. 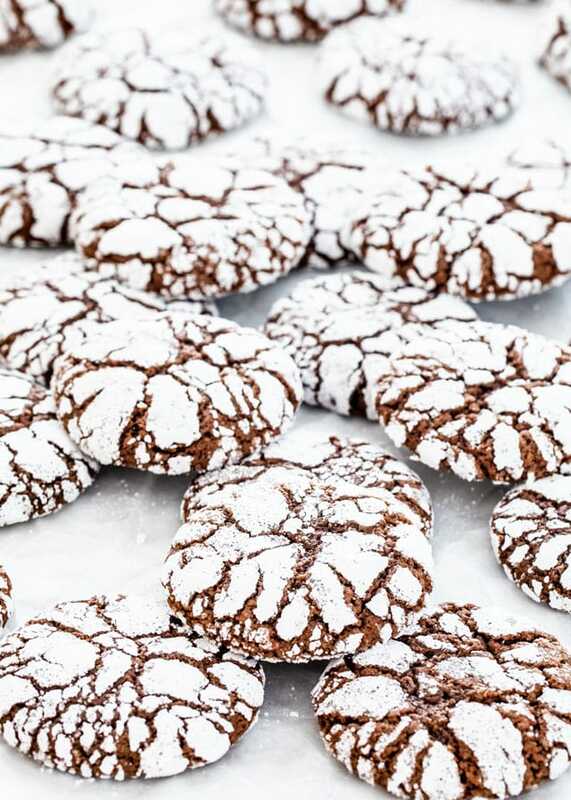 Yesterday I had my 6 year old granddaughter and 3 of my friend’s girls making cookies and we made the chocolate crinkle cookies eith chocolate kisses in the middleThey turned out great and very impressive . Everyone was happy with sampling the cookies. Yum!!! I make red velvet cookies like these using a red devils food cake mix! Huge hit at Christmas time! I was intrigued by these cookies I never heard of before. I just got around to making these today and they turned out perfect, wonderful to find something new and scrumptious! The only modification I made was to use the orange zest of almost a whole orange. I had bought some orange essence but it just didn’t seem to provide a bright orange flavour I was looking for. I didn’t try the Grand Marnier which I’m sure would be excellent. So glad you liked them Allie, we loved these cookies too, they were great! Chocolate and orange = divine combination! I must try these cookies sometime.